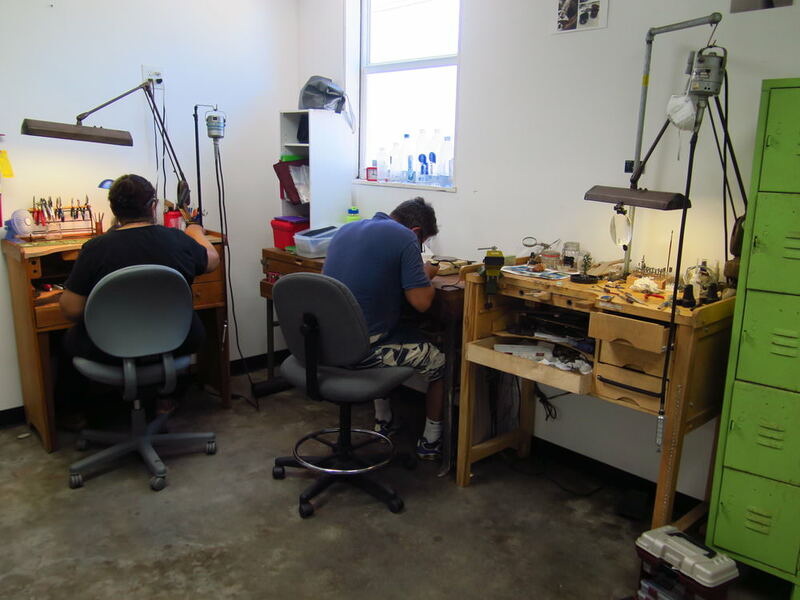 Studio Membership gives you access to our fully equipped jewelry workshop to use anytime. We offer different options depending on your needs and budget. Monthly membership is our most popular and gives you full access, and hourly membership has set times and is limited. Monthly membership does require an initial 3 month agreement, and then goes to month to month. take a look at The Workshop page. Full access, except while a class is in session. Classes and limitations to this space are minimal. When you arrive, pick a spot and get set up! Full access. In this private room, your bench is there to use anytime and there are no limitations as to when you can work. The rest of the workshop is still available to use. Full access. Same as the previous option but this room has a door that locks. If you'd like more privacy, this is the option for you. The entire workshop is available to use. Hourly membership gives you access to the entire shared space in the workshop. The times available are in 3 or 7 hour blocks between 10-5pm and from 6:30-9:30pm on select days. Other options may be available at later a date. Hourly membership is for students who have completed Fabrication and Soldering or have similar competency in fabrication and soldering. Guided Open Studio: with instructor supervision and tool rental is $15/per hour in 3 hour blocks. Open Studio: without instructor supervision is available in 7 hour blocks between 10-5pm with or without tool rental.